With its vast distances, Australia is perfect for long road trips. And extensive drives along the country’s magnificent coastline or through the emptiness of the Outback continue to be perennial favourites with travellers of all ages. In fact, seniors – or ‘Grey Nomads’, as they are affectionately known to Aussies – are a common sight on the roads, often embarking on trips of several months or more. Sometimes driving a camper van or towing a caravan behind the car, they criss-cross the countryside year-round. A lengthy trip ‘around Australia’ is popular with families and has almost become a rite of passage for newly-retired seniors. This highway runs right around the rim of Australia. To complete this trip fully covers more than 25,000 kilometres and can take nine months. The 244-kilometre Great Ocean road from Torquay to Portland around the country’s south-eastern coastline. Built by returned soldiers between 1919 and 1932 and dedicated to those killed during World War I, the road is the world’s biggest war memorial. Winding through varying terrain along the coast, the road provides access to several prominent landmarks, including the Twelve Apostles limestone stack formations. A popular road trip involves circumnavigating the island of Tasmania via Hobart, the East Coast, Launceston and the West Coast. The main route is via the sealed Stuart and Lasseter highways – a distance of 1,956 kilometres. This goes through remote areas and requires a sound, recently-serviced vehicle, with a spare tyre, tools, plenty of extra fuel, food and water. There are long distances between towns and facilities , so it’s important to thoroughly plan the trip before setting off – try to travel in groups and ensure you tackle it at the best time of year. Inform family or friends of your intended route and expected arrival time. You may also consider hiring emergency communications equipment like a satellite phone or an Emergency Position Indicating Radio Beacon (EPRIB) device. Crossing the vast, treeless Nullarbor Plain on the Eyre Highway, where the Southern Ocean strikes the cliffs of the Great Australian Bight on one side of the road, and the desert stretches to infinity on the other. While this is a sealed road, it also travels through extremely remote areas and requires the same precautions and thorough preparation as the Darwin-Uluru trip. You need a 4WD vehicle to venture off the highway. Exploring the natural attractions of the Blue Mountains World Heritage Area, just west of Sydney is always popular. This area includes seven national parks and a conservation reserve. The Greater Blue Mountains Drive includes 18 discovery trails that branch off the main route. Queensland’s Sunshine Coast has famous beaches and coastal resorts – and a cool, moist hinterland featuring the Blackhall Range, which is ideal for a scenic road trip. Western Australia’s south-west region features a 200-kilometre drive from Cape Naturaliste and Cape Leeuwin. Midway along this coast, a detour inland leads to the Margaret River area, one of Australia’s premier winegrowing regions. There are about 130 high quality wineries in the area. The Legendary Pacific Coast covers 900 kilometres between Sydney to Brisbane. It includes the city of Newcastle, superb beaches, green hinterland and a host of iconic Australian holiday resorts. In the other direction, the Grand Pacific Drive stretches from Sydney starts in the Royal south along the coast to Wollongong, Shellharbour and Kiama. This drive runs through rainforests and past seaside villages along a strip of stunning coastline. And, that’s just a sample. I read once that everyone has travelled some part of America’s iconic Route 66 – “if only in their dreams”. It’s certainly a similar story in Australia, the acknowledged “home of the road trip”. Right across the continent, roads carry travellers through diverse geographical and environmental regions; linking coastal, hinterland, inland and even Outback areas. Journeys like the Great Ocean Road; Highway One; the Nullarbor Plain: Tasmania; and Darwin-to-Uluru roll off the tongue readily. However, Australia also has a superb network of lesser-known highways and useful ‘tourist drives’ that quickly take visitors from attraction to attraction within regions. These drives are suitable for motorists of all ages, with towns, villages and rest areas aplenty. In the most populous State of New South Wales, for example, well used drives include the Greater Blue Mountains Drive; the Legendary Pacific Coast; the Grand Pacific Drive from Sydney to Wollongong; and the spectacular Kosciuszko Alpine Way in the Snowy Mountains. Other scenic drives are along the Waterfall Way on the northern tablelands of NSW; the Poacher’s Way food and wine trail; and the historic Long Paddock drive that follows the old stock routes of Country NSW. The Darling River Run takes you on a great journey into Outback NSW, travelling from Walgett in north-western NSW to Wentworth on the Victorian border. Another of our favourites is the Golden Highway, which runs east-west in New South Wales, linking the mining and winegrowing areas of the Hunter Valley with the wide open spaces of the state’s Central West. A good example of a ‘tourist drive’ that links attractions within an Australian region is Hinterland Tourist Drive 28 that runs between the quaint Australian riverside town of Wardell – with its prominent opening bridge – and the picturesque Alstonville Plateau on the New South Wales north coast. As it leaves the village atmosphere of Wardell, the route passes through lush rolling hill country peppered with the homes of fortunate locals. Looking out the car windows, our envy was obvious. In many places, the drive resembled roads in Southern England, with dense trees and vegetation from either side almost meeting overhead in a green tunnel. Ballina Coast and Hinterland was once part of a massive rainforest known as The Big Scrub and one of the last remaining remnants can be found along the drive – at the Victoria Park Nature Reserve. 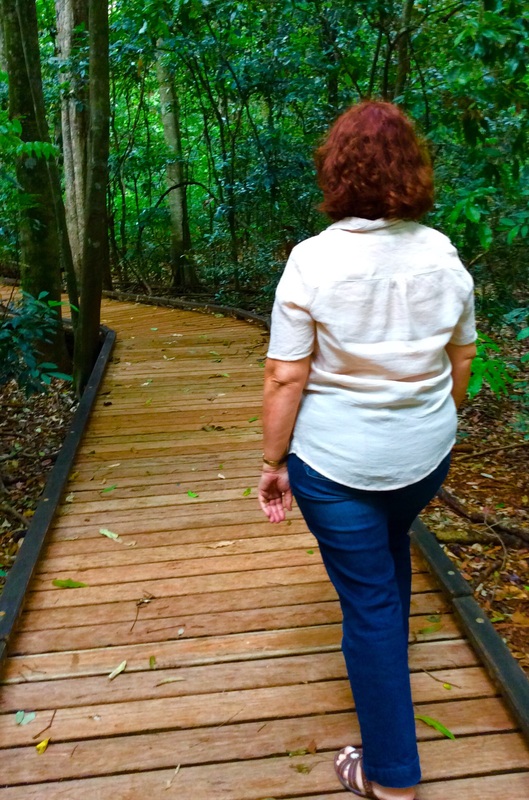 The reserve has a boardwalk – easily accessible to travellers of just about all ages – that takes you deep into impossibly tall and thick vegetation, including snaking Figs, palms and ferns. 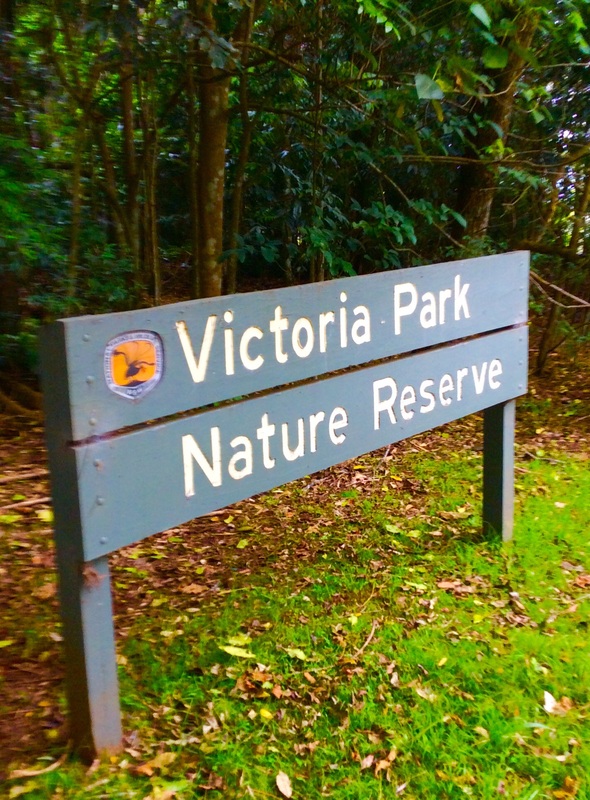 We made use of the reserve’s picnic facilities, enjoying the cool rainforest atmosphere, the unending chorus of birds and the antics of small marsupials known as Red Necked Pademelons. Then we rejoined Hinterland Tourist Drive 28, bound for the Summerland House Farm, at Alstonville. This working farm – it’s produce includes macadamia nuts, avocados and hydroponically grown vegetables – is a ‘House With No Steps’ business enterprise, dedicated to providing employment opportunities for people with a disability. 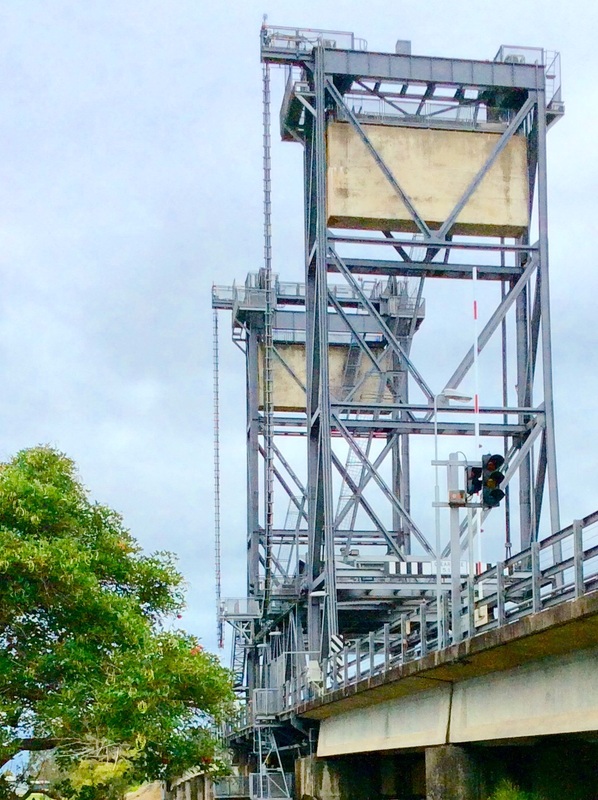 Later, we set out to follow Tourist Drive 30 from Ballina Headland and Lighthouse north to Lennox Head – and marvelled at the breath-taking coastal scenery linked by this route. Tourist Drive 30 takes the traveller to gems such as Pat Morton Lookout, where we soaked up the view of sweeping beaches and watched para gliders soaring above the cliff tops. 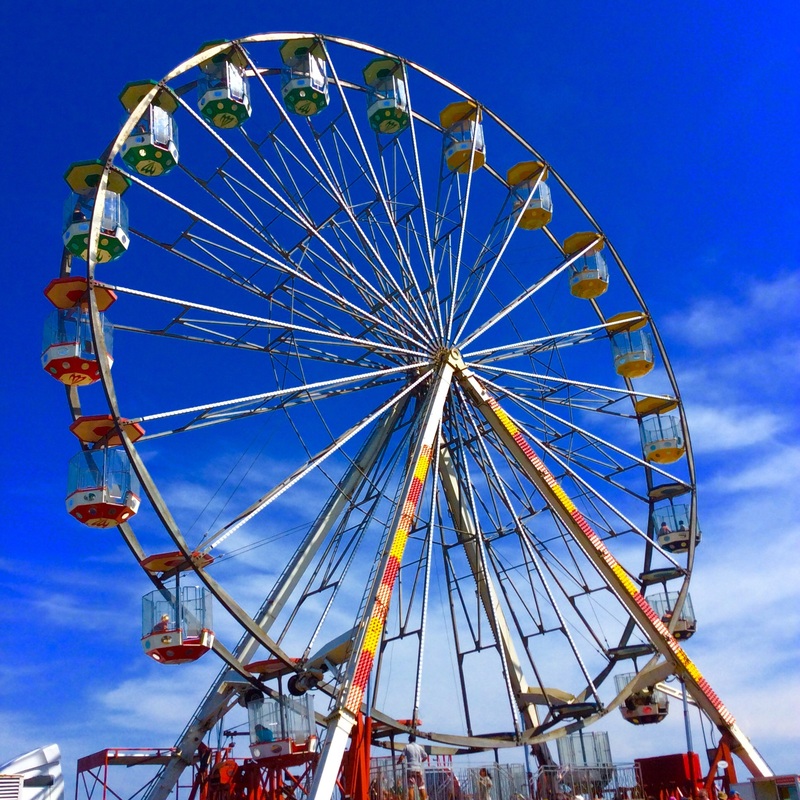 These tourist drives are wonderful for visitors because they bring together a range of attractions in a relatively short and well signposted run. Like America’s Route 66, each of these drives certainly still kick. Witnessing community spirit is good for the soul. A road trip to Australia’s Ballina Coast and Hinterland allowed us to listen to the locals talk with pride about their remarkable part of the world. And it left an indelible mark. To say we’re impressed is an understatement. For us, it’s a bit like: “We’ll have whatever they’re all having”. Such ‘can do’ attitude, self belief, determination to find new ways of doing things and commitment to quality service is always uplifting even in small measures. But the Ballina Coast and Hinterland is fortunate to boast these attributes in bucket loads. We found entrepreneurship and community pride enough to convince us that the Ballina Coast and Hinterland is indeed a special place – not only as a desirable tourist destination, but also to settle, start a business, raise a family and turn dreams into reality. 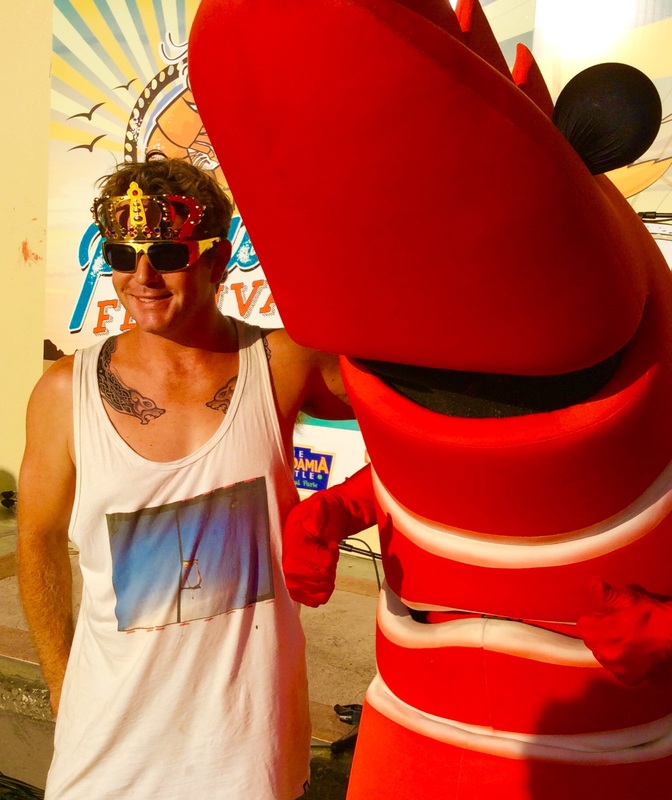 The second annual Ballina Prawn Festival was a perfect example. 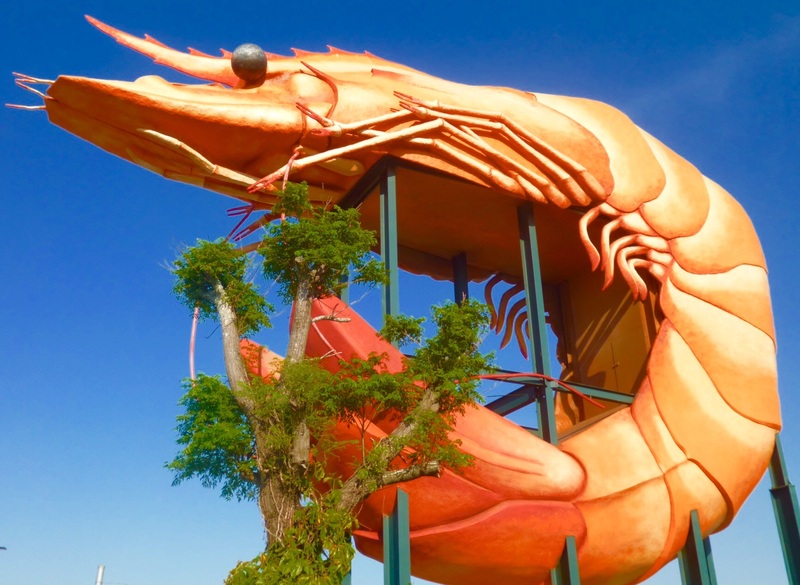 Ballina is well known for the ‘Big Prawn’ that stands on the outskirts of the town, so this festival was a logical extension of that fame and a celebration of the importance of the local seafood industry. Enthusiasm for this festival met us at every corner. Everyone was going; wanted to know if we’d be there; and felt it was important to showcase what the area could do. It was an impressive show of support for the Ballina Prawn Festival – and it wasn’t an exaggeration. The big crowds who braved hot weather to attend the 2nd annual festival, centred on Ballina’s Missingham Park, were certainly enthuastic. Crowds clapped acts on the main stage; took part in the various events in big numbers; stood in often trying queues for the Ferris Wheel; delighted in the prawn shelling; urged on craft in the DIY Raft Race; and lined the riverbank for the Spectacular fireworks that ended the festival. Festival-goers loudly cheered Torben Mikkelsen, of Yamba, when he shelled and ate half-a-kilogram of prawns in 1 minute and 43 seconds to retain the title he won in 2013. And, at every chance, people eagerly praised the festival concept and the importance of such promotions to the continued prosperity of Ballina Coast and Hinterland. The enthusiasm was infectious and certainly uplifting. To us, it seems that a visit to Australia’s Ballina Coast and Hinterland is good for just about whatever ails you. Ballina and surrounds are about 745 kilometres north of Sydney in sub-tropical northern New South Wales. Alternatively, the area is just over two hours by car South of Brisbane. For our visit, our hosts were the Best Western Ballina Island Motor Inn, the Central Ballina Holiday Park and the Alstonville Country Cottages.